The Oathsworn series by Robert Low brilliantly solves the central difficulties of conveying the Viking viewpoint in fiction. On the one hand, he must plunge into the mental world of a millennium past when belief in the fierce pagan gods was tested by conflict with Christianity. On the other, he must portray men who were, by our standards, ruthless, murdering brutes who won fame and fortune by butchering whoever stood in their way. Thieves, rapists and killers are not the usual companions for a journey through five successive novels. 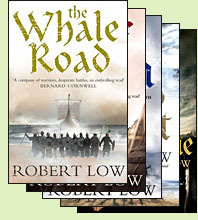 Low’s solution is to begin the first novel, The Whale Road, with a young man drawn into Viking life by accident. Orm is bound to his company of raiders by a powerful oath to Odin, one that destroys those who betray it but is scarcely kinder to those who keep the faith. With plots based on a series of quests, hard journeys after distant prizes, Low draws the reader into a set of tales in which a steady flow of blood is the price of a daunting endeavor that transcends the basic Viking life of crossing the sea to burn and pillage. Because he delves deep into the patterns of belief comprising the old Nordic mind and unsparingly depicts the cost of their fierce way of life, Low draws his readers to sympathize with characters who are far from saintly. We soon find ourselves moved by the fates of these men and women, entangled in a web of doom spun out by forces beyond their control. Along the way we travel the broad water-linked world of the Norsemen, back and forth across seas to the shores of England, Ireland, Denmark, Norway and Sweden, and up rivers into lands of the Slavs, to the steppes of the horse people, and to the deserts of the Middle East. Because the Oathsworn novels make the inner world of the characters seem real, so too does this strange, rich tenth-century world.